I sincerely hope that Turn10 has been paying attention to this thread. You guys and gals have done some amazing work to analyze and improve the FFB. If I were a big wig at T10, I'd be considering some form of compensation to use the work you all have done here and implement it in the next Motorsport game. But, I'm pretty sure "honest business practices" is not how Microsoft typically makes their money. Hopefully, T10 dont just use the people who develop these things as guinea pigs and then use a altered version of their work for their next game/s, I would assume not. Though it has been done before with other substantial companies. I have posted a topic over in the support section but i know there are some real wheel guru's in this thread and i would really like to get back on and have a play so i thought id ask my question here too.. I have inverted my G920 pedals (for pc use they work great) and want to try the new update on my xb1 but there are no settings to invert the pedals in the game. Am i missing something and being stupid or is this actually an issue? You do not need to invert the game signal at all unless you've mounted the pots backwards or something. Thank you Blue, helpful as always :-) Thats what i thought when i set it all up originally as the pedals obviously still are pushed not pulled, but then all pc games i had to invert. Maybe when i rewired i got the wires round the wrong way, i thought i had enough photos and labeled them well but when i went to reconnect the wires and everything was now upside down i realized i hadn't. So i guess i can just change the wires round on the connections? I hoped this might be the case but i didnt want to try swapping them incase i fried something. Hey great work with emuwheel. I can actually get my lap times similar to the gamepad now. Just one question, is it normal for the buttons on my thurstmaster T300RS to stop working when not driving a vehicle. e.g. if I pause the game with one of the buttons on the wheel, I have to use the keyboard to get back to driving and it usually takes a second or two for the FFB to kick in and steering inputs to be recognised. Is this how it's meant to work or have I done something wrong? When ever i do burnouts with my G920, the steering wheel bangs left & right. I think it happens with slow speed power skids too, like if i whip it round on grass, then just keep into it, the steering wheel starts shaking. Off the top of my head, i can't think of this happening on other games, i've been playing Forza too long lol & it only started on Forza 7. Does this happen with everyone else, or on other wheels, or is my wheel on the way out? Doesn't happen on my Thrustmaster TX (Xbox). 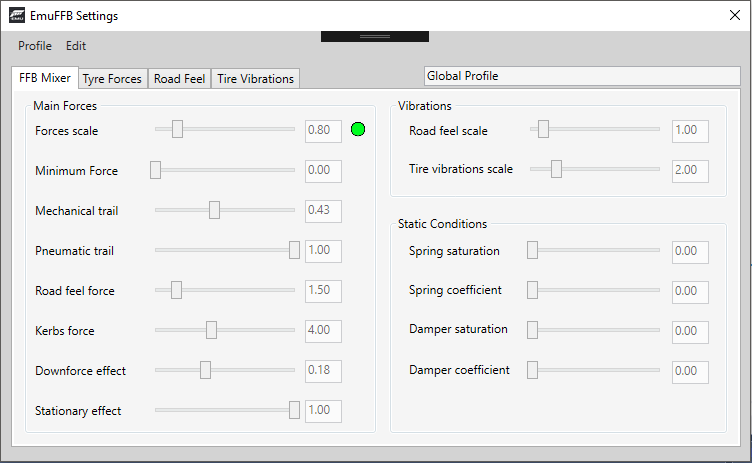 If you have the damper scale turned all the way to 0, then it seems like the wheel will turn at any slight shift in the weight of the car (at least on my G920). I have the dampening set to about 10 and it doesn't do that anymore. This was also a problem in FH3's FFB. I have bought a brand new Fanatec CSL Elite with CSP V3 pedals to play AC and R3E. I want to try it with FM7, but i can't find settings... If here someone plays on PC with the same wheel as mine, can he share with me his settings, please ? You would need to ask him any fanatec specific questions, as I use Thrustmaster and Logitech wheels. He usually responds fairly quickly. 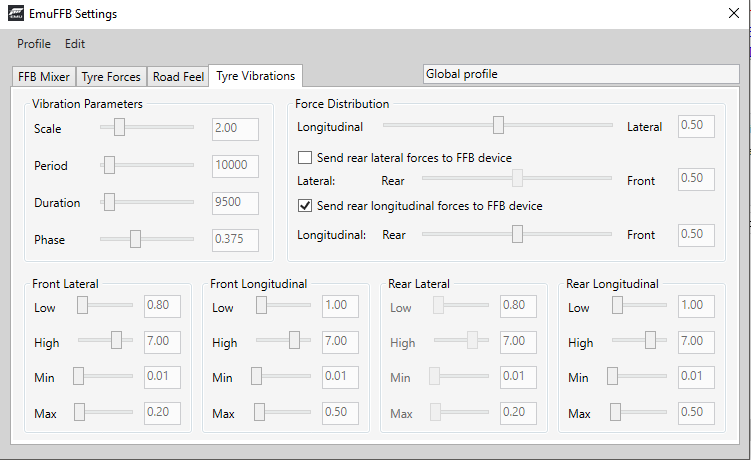 @Blue and other beta testers, how hard/easy is it to correct slides with yet-to-be-released Emuwheel FFB + sim steering, compared to vanilla FFB + normal steering? Depends on the car really, a well balanced car feels quite similar but I think sim steering will always be a bit more challenging, just because if you get it wrong you will get punished were normal steering pretty much holds your hand the whole time. Here are the rest of the EmuFFB panel tabs... Getting really close to release. The idea is that you use mainly the mixer to scale the effects, if you want to go deeper, you go in other tabs and adjust there. Very cool feature of new version is that you can adjust all FFB settings and they immediately change the FFB you're getting, without the need to restart EmuWheel. menus in FM7 when using EmuWheel. plato they need to just plop ur program into the next game. I personally dont want to fiddle with all the nonsense and wish they could just have good defaults but i know this is asking far to much of t10. Personally i dont mess with ffb much, i do know i can make it better in most games but dont both with it unless its bad (forza). @PTG Baby Cow The reason for all these settings being exposed to user is not because to make one's life more complicated (although I realise that it might), but because given almost 2 years of experience supporting users with wheel related issues in Forza games for PC, I've come to the conclusion that "having good defaults" is simply an impossible task, since different users using the same hardware can have quite different and sometimes incompatible expectations of how FFB should feel like. So even if I had access to most popular hardware that is used in Forza games and even if I came up with settings I consider to be good for each hardware, there would still likely be a significant portion of users who wouldn't be happy with them. That is why I've decided to create a solution providing options for users to tinker with which might sacrifice accessibility. I think this is the right decision, given the fact that those who will ever attempt to run EmuWheel are the ones who look for options and are willing to download third party tools to potentially improve their experience in Forza Motorsport 7. It would be a more difficult decision if my intention was to monetise this project in which case the success of it would at least in part depend on how accessible the end product is. In other words, I do not have financial incentive to work on Forza EmuWheel and I will continue to develop this software as long as I feel there is significant demand for it which justifies the time I'm spending on this project. That being said, the newest version will include default FFB settings and also ability to save, load global and per-car FFB settings which will be stored on your pc as files, which means that you will be able to easily share them with others or use settings made by others. Depending on how popular this feature is, I might come up with a centralised solution to access settings made by other users and share your own. I still maintain that T10 need to hire you Plato. I said this before and I will say it again. It is highly unlikely that people working on triple A title can't figure out something that two guys without previous experience could figure out in few weeks. The possibility that me and Blue028 have abilities beyond of those people who work at T10 is far lower than the possibility that T10 just has different priorities while developing and improving their games. My best guess is that while it might appear that there are a lot of wheel users (because they are quite vocal on forums), they likely constitute an insignificant portion of user base and since T10 probably have other stuff they want to implement / improve, addressing needs of the relatively few will be at the bottom of the priority list. Very well said Plato. Personally I've been using wheels since Forza 2 on the XBOX 360. I've just gotten better and better with every new Forza release. I agree that overall the wheel user base is literally insignificant in size compared to the entire Forza community. I've tested this Demo on PC and is just felt horrible. 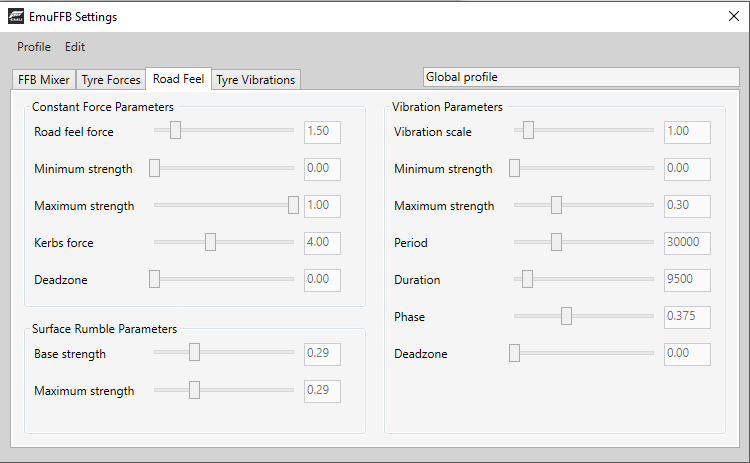 The only thing that has really changed in the full version (stock FFB) is the default setting have been adjusted and descriptions of the advanced settings have been updated to better describe what each setting actually does. Apart from that it is mostly the same, and issues with settings like sensitivity don't work as they were intended to. The one thing PC really has going for it is EmuWheel, the new custom FFB is simply awesome. Having been using the test version with UI implemented (see pictures posted above) it is such a breeze to use and tune the FFB exactly how you want and it updates in reatime. 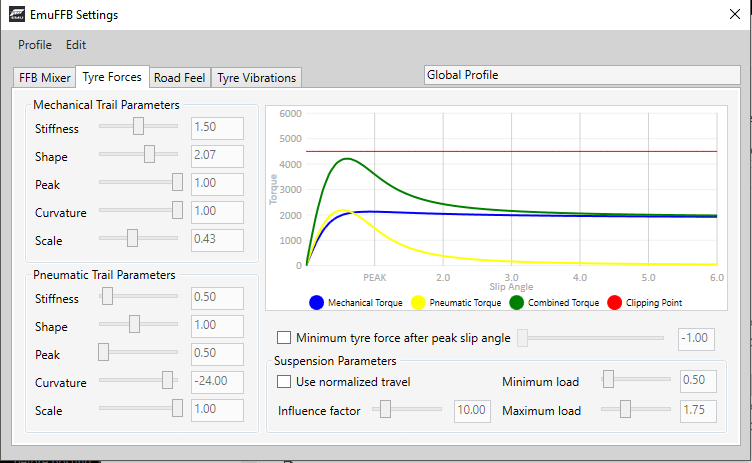 The visual graph allows you to easily tune the FFB torque curve to achieve the exact feel that you want (FFB drop off, how much/how little, drop of point so you can really feel the edge of grip etc) on top of the added FFB effects like road feel, downforce influence, dynamic vibrations, stationary damper effect etc. And, when when FirstPlatoLV finishes working his magic, FFB settings will even be able to be saved per car.